Born in Vicenza on August 22, 1913, Gastone Tosato was organist and choir director. He completed his musical studies in Vicenza and perfected himself in Rome, where he settled in 1936. 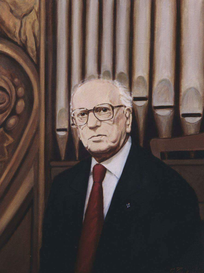 Valente organist of various Roman basilicas, he became instructor of the children's choir in the Basilica of San Saba and in 1945 he constituted the "Italian Polyphonic Quartet" "Later" Coro della Vallicella ". He dedicated himself to the rediscovery of sacred and profane polyphonic music. In 1950 he founded the "Roman Polyphonic Choir" based in the Oratorio del Gonfalone, to which was added the "Instrumental Complex of the Gonfalone". Gastone Tosato died in Rome on 6 April 1991, while he was in his office in the Rome office of the Oratorio del Gonfalone.